The bark of a tree is dead tissue, placed there to insulate the tree to some extent and protect it from damage…squirrels and bears climbing, lawnmowers running into, etc. As the tree grows and expands the bark naturally has to give and separate a bit. On rough-barked species we generally don’t see those cracks but on smooth- or thin-barked trees they may occasionally show up. Sometimes, as on a birch tree, we declare that the curling bark is attractive and we enjoy it. On others, maybe you ought to be concerned. So when should you worry? Frost crack on tree trunk. Courtesy of University of Michigan. Good for the tree? No! Should you be distressed? No. Trees have been getting frost- or growth-cracked for eons and somehow survived. 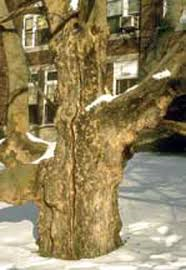 Sometimes on rough-barked trees, the outer layer will pull away from the main stem as it grows. Should this perturb you? Not necessarily. 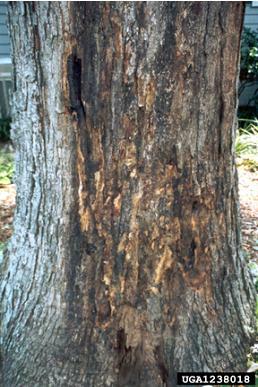 Diseases and insects, though, can cause bark to loosen and sometimes fall away. So in this case, investigation is in order. Get a little concerned. Take a good look at the inner surface. If you see tiny drilled holes or winding grooves, those may be insects that are tunneling into the tree. Not good. Perhaps you see soft, dark, perhaps oozy and foul-smelling areas. These indicate a bacterial rot sometimes called Slime Flux. 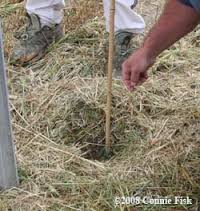 Or you may encounter the light-colored, stringy or fluffy material that indicate a fungal disease. Back off and take a good look at that tree. Are there areas of bare branches overhead? This is the portion of the tree fed by the sap that used to pass through that diseased or insect-infested area. Dead branches can be a hazard. Now begin to worry! 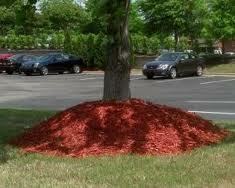 Get an arborist to look at that tree. The tree’s condition, the cause of the problem, options for treating the disease or dealing with the insect, the tree’s location, the possible damage that would result from falling branches or the whole tree, the effect on the landscape by removing it, all need to be weighed to help you decide if it’s time for real distress. Short Day, Long Day: Does It Make a Difference to an Onion? As you work through a seed catalog and stop in the onion section, you’ll be confronted with a choice between “short day” and “long day” types. So what does that mean and is one better than the other for our area? 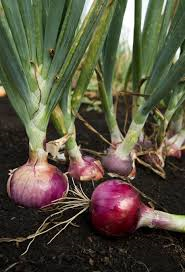 This is a comparative term which refers to the approximate hours of daylight a variety of onion will need in order to start developing the bulb. Short Day means about ten hours a day, while long day means twelve hours or more. Vidalia, as in Georgia, is a short day onion. Onions are considered a cool season crop. In theory, short day types would be better suited to the South; they would mature before summer temperatures arrive and the threat of bolting arrives, sending up a seed stalk, that is. The Walla Walla, as in Walla Walla, Washington, is long day variety, more appropriate to the north where somewhat cooler conditions prevail. At least that’s the theory. But of course plants don’t always go along with human theories. Talking with a number of experienced vegetable gardeners, at least in our area it doesn’t seem to make much difference which type you plant. The variety itself, in terms of sweetness, color, size and days to harvest, how and when you’ll plant them and how you’ll use them- green or as keepers- will have a greater impact on your success than just the long or short day label.